No matter where you are coming from, we are committed to offering a range of safaris that will provide the safari of your dreams at any price point. 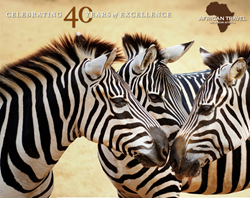 African Travel, Inc. is celebrating four decades of providing industry-leading African safaris by offering special promotions each month beginning in April. Guests are encouraged to sign up for African Travel’s newsletter in order to receive these discounted birthday offers for the remainder of 2016. African Travel’s celebratory legacy of excellence is evident from its continued industry recognition, including being named the “Best Tour Operator to Africa” by Recommend readers and the #3 Top Safari Outfitter in Travel + Leisure’s coveted World’s Best Awards. With 40 years of experience, African Travel is the longest established North American travel company that focuses exclusively on Africa. Guests can visit African Travel’s website and sign up for the newsletter. Follow African Travel, Inc. on Facebook, Twitter and Pinterest, and join the conversation using the hashtag #WeKnowAfrica. African Travel, Inc. is a 40-year-old safari operator, with operations in Africa and the USA, offering customized and locally-hosted safaris to Africa at all price points. The company’s focus is solely on planning and operating safaris in Africa. We have dedicated, experienced teams in Africa, Safari Specialists in the USA, an extensive transportation fleet, numerous hotels, camps and lodges throughout The Travel Corporation's Africa-based associate companies. Refer to AfricanTravelInc.com for a wide variety of ideas and safaris. Created as a joint initiative between The Travel Corporation’s family of brands, The TreadRight Foundation is a not-for-profit working to ensure the environment and communities we visit remain vibrant for generations to come. To date, TreadRight has more than 35 sustainable tourism projects worldwide. The foundation’s guiding principle is to encourage sustainable tourism development through conservation, leadership and support for communities.